Shop for Nail Polish from a variety of different brands. Greener Beauty is always vegan, always cruelty free, only ever ethical brands and always toxic chemical free. 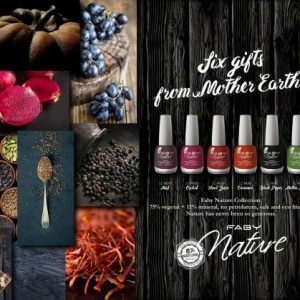 A two coat efficacy nail colour system made with 85% bio-sourced ingredients and without harsh chemicals. All the Faby Nail Polish collection is Cruelty Free, Vegan Nickel free and Big 5 free. The Faby Nature Range is inspired from the natural world around us. The Lacquers are made of 87% natural ingredients. derived from wood pulp, cotton, maize, cassava and other raw vegetable materials. All the Faby collection is Cruelty Free, Vegan Nickel free and Big 5 free. Maggie Anne Chrome Effect Nail polish available in 3 different colours. Maggie Anne Holographic Sparkles Nail polish available in 3 gorgeous shades. The Maggie Anne range is 6 toxin free gel effect nail polishes are ultra glossy, high shine, with a sensational gel like finish. For Stronger, Healthier Nails, the Nail Polish that Breathes. An three-in-one formula, ORLY Breathable Treatment Colour contains the strength boosting benefits of a treatment and the colour of a nail polish. Celebrate with these exotic other worldly tones from the future invade the creative sphere. Suspiciously similar to the Earth’s naturally occurring rocks and minerals, these interstellar shades exist on the narrow border between reality and the sensational imagination. Elegant and classical French Manicure, or modern and trendy colours, the ZAO nail polish range will meet all your desires. Try our dazzling new Winter Collection to match your winter look. Choose from Petrol Blue, Amaranth Pink or Passion Red.